People think of Cebu and they think of beaches. Me I think of sweets. Nope, not the famed dried mangoes. I think of pastries, cakes, cookies, warm brownie cups, pies and everything else that puts a grin on my sweet teeth. I spent more than a week in the cities of Cebu and Mandaue recently and in spite of the 6.9 earthquake that sent me rushing down three floors and the subsequent aftershocks, I had a really sweet time at this wonderful place where everyone seems to be just eating and eating and eating. I never took a table here. It has always been a take-out of the cheesecakecicle. 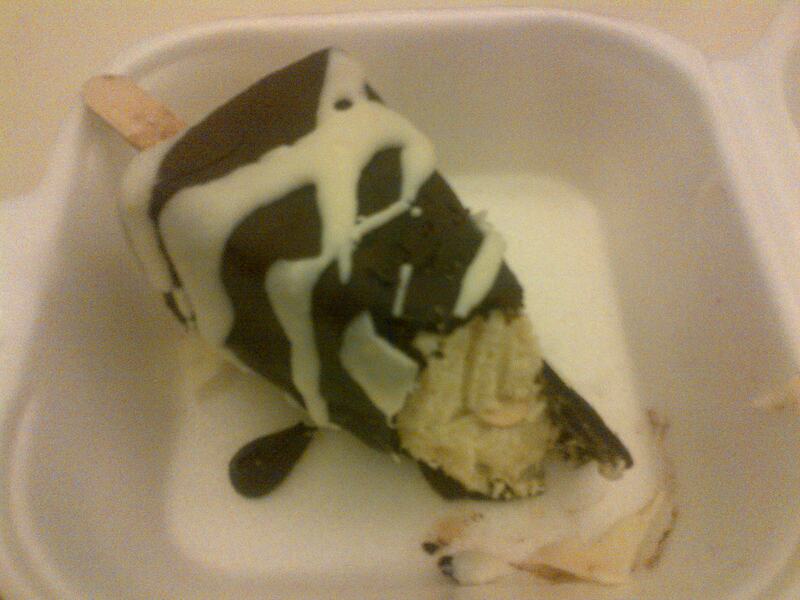 A piece of cheesecake covered in chocolate sauce then frozen. Convenient and yummy! Skewered on a popsicle stick, you can have your cake and really eat it too! It just opened in 2010 but this place has already attracted hordes of loyal followers; me included. It was the perfect way to remove some aftershock stress two Mondays ago, the day the quake shook Cebu and nearby Negros. Sure, there was a mild aftershock which sent my chair shaking a bit but I was too busy enjoying the Chocnut Sansrival to get nervous. On the course of the next few days, I visited this place about four times. Everything here is absolutely delicious down to the ladyfingers dipped in white chocolate. The Cheesecake Delight is a rich chocolate cake with.. get this… cheesecake inside! Be warned: if you’re like me that have desserts before the main course, this is a tummy filler. So have it after dinner or else the decadence will leave you so satiated. I also had dinner twice here ordering Prawns in Pasta with Aligue Sauce and a bacon and cheese sandwhich. Simple, hearty, and yummy. Too bad they only have a single branch located in A.S. Fortuna. The plain white sign that looked more doesn’t belie the yummy treats inside the low cafe/restaurant. I was raving about this place a couple of years ago. 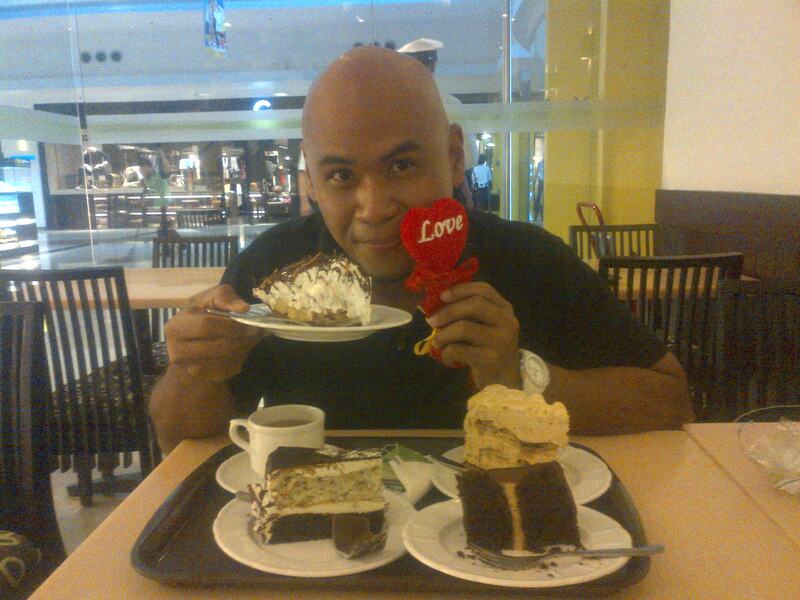 This was my introduction to the sweet world of Cebu’s dessert outlets. It has since opened a stall at SM Cebu dispensing its famous warm brownie cup. But ever since discovering Fudge, I have since rated the former as my favorite dessert place edging out La Marea. It didn’t help that when I re-visited last week, the Warm Yema Cup tasted ordinary. Nothing exemplary. The yema cake was a little dry and tasted more like milk than yema. I tried to save the experience by ordering a mango cobbler but it turned out too sour and to sweet, like eating a cheap mango preserve. Remove the ice cream from both desserts and it would have turned-out bad. Thumbs down for my experience here. It still has a wide variety of desserts though. 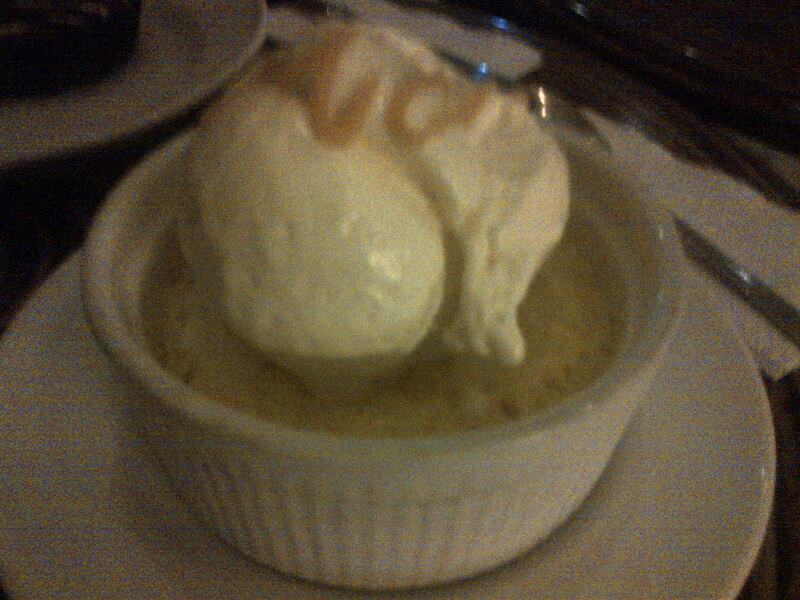 La Marea is in Crossover at Banilad. Not good. Not bad. Just okay. The name conjures traditional home-baked sweets such as torta or bibingka. But no, the Banoffee Pie rules this place. Chunks of bananas in a sweet butterscotch sauce topped with light cream— banoffee pie is a make or break item. Easy to make but easy to mess-up. Leona’s does it really well. I’ve always loved the combination of mint and chocolate–very refreshing to the palate. Leona’s Fudge Mint Delight was just that—refreshing and yummy. The savory slices of cake loaves and savory breads were tempting but I stayed close to the refrigerated goodies. This green and white bakeshop has branches all over. I went to the ones at SM Cebu and J Centre Mall. Can you taste the bananas? 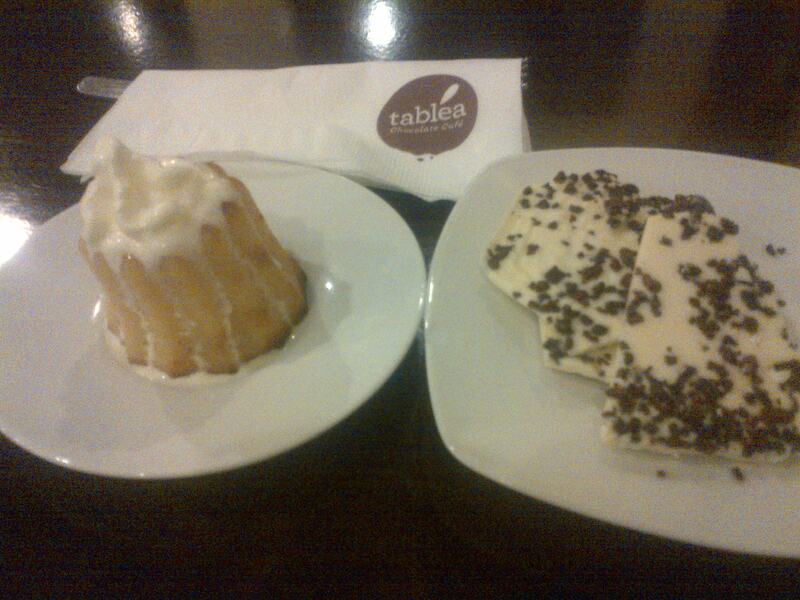 Who doesn’t like tablea— that rich local chocolate medallions that can be turned into a hot drink or used in desserts? This little cafe near the escalator at J Centre Mall in Mandaue is probably the best place to have nifty desserts made from .. what else… tablea. I brought home a pack of tablea polvoron (Php 80) and a pack of chocolate-covered cacao beans (Php 150). Very very very good. Pure chocolate bliss. I just had some French macaroons to take-out at this swanky place with bright minimalist interiors. Think of Bizu. Not much choices but there was a promising-looking Praline sansrival. The coconut macaroons were a little chewy though. It should have been a little crisp on the outside. Tasted good. Find it at Ayala Center Mall. 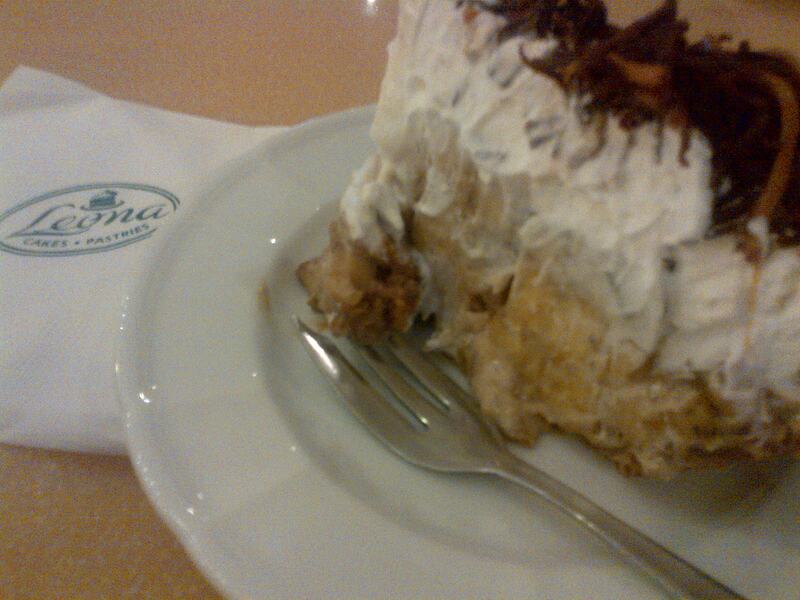 I think Cebu is the best place in the Philippines if you have a sweet tooth. Not even Metro Manila can compete with the number of dessert outlets. Cebu has really outstanding places and the offerings are creative, yummy, and inexpensive. In an era when dessert places have names such as “Dessert Factory” and “Goodies n Sweets” which all conjure visions of saccharine heavens, “Fudge” sounds so dry and dreary. Repeat after me— “Fudge.” It comes out of your pursed lips like an obscene word. Even the signage out front the ordinary facade of the small place is so well….. ordinary you’d give it a miss. But step inside, feast your eyes at the cakes on display, grab a seat, place your order and be delighted. My first time there, I had a most rich cheesecake baked inside an utterly thick and decadent chocolate cake. 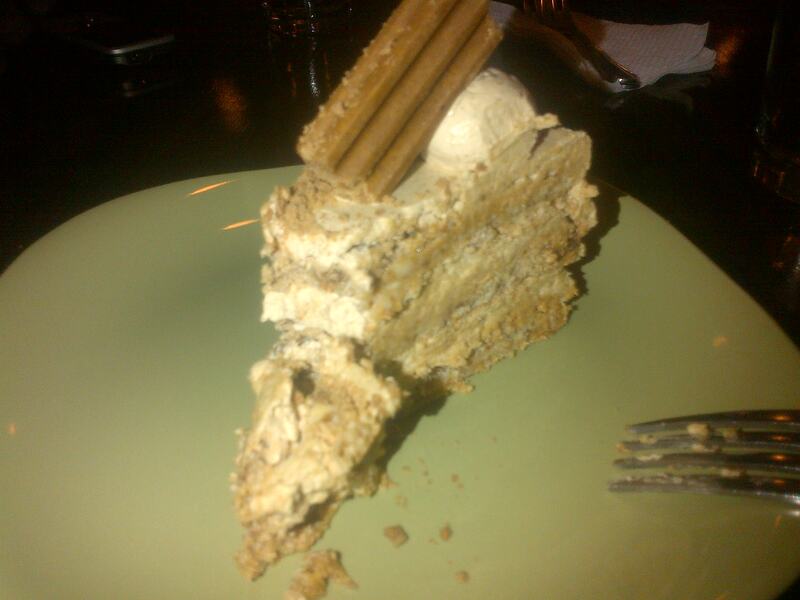 The following night, I tried the famous Chocnut cheesecake. It was smooth and had the unmistakable Choc-nut taste that reminded me so much of my childhood. Forkful after forkful of the wonderful cake awakened my taste buds to the nutty taste that had long since been gone from my gastronomic senses, replaced by the now more popular and cheaper, Hany. I put down my fork with both appetite and taste buds appeased. The rule when dining in dessert places is to leave as soon as you put the last crumbly morsel in your mouth. It is not a place to linger lest you develop diabetes in one sitting. As I sat at the small table in light conversation with Annie, the White Chocolate Cheesecake sitting so dainty and pretty on the refrigerated glass stand beckoned to me. I walked over and saw how beautiful it was. The icing looked like a dress with curled up designs. It also contained one of my favorite ingredients— white chocolate. I had to have it. I ordered it, delighted in it and promptly left as the Blueberry Cheesecake jealously beckoned. And now as I write this, I have a Brownie Cheesecake, a Mango Delight, and Sansrival, and a Ladyfinger all waiting to be tasted.